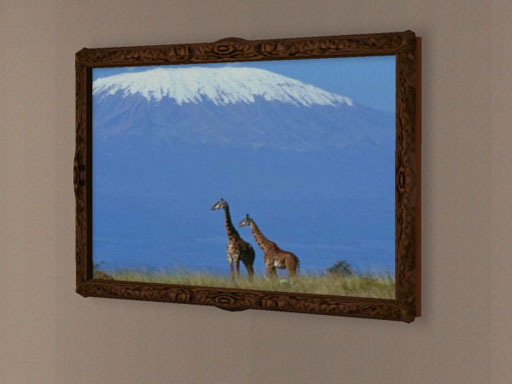 Rising 19,340 feet above the border between Tanzania and Kenya, majestic Mount Kilimanjaro is the highest peak in Africa and also the tallest mountain, relative to its base, in the world. 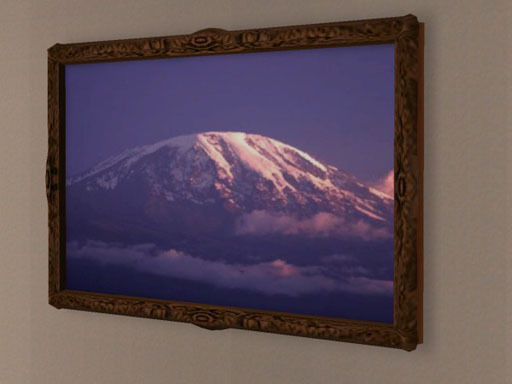 Here are two pictures of magnificent Kili for your Sims' walls so that they can enjoy it, too. This is a recolor of the "Tomatohead" painting. Thanks, RamRom! Glad you like them! It's Kili! I can almost see Greg and Rolf up there! They're waving to you, Coco! It brings to mind tales of adventure, Greg. Did you ever read "Hunter" by John Hunter? Yes I have! In fact, I believe I have two copies of the first edition of "Hunter" somewhere in the Warehouse of Doom!